Stretching the One Income Dollar: Searching For the Perfect Hostess Gift This Thanksgiving? Searching For the Perfect Hostess Gift This Thanksgiving? Invited out this year for Thanksgiving supper? 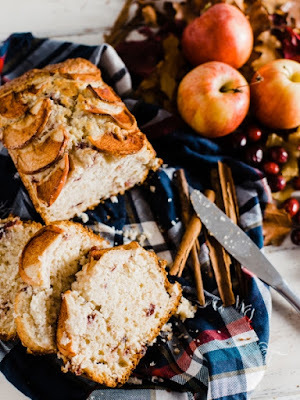 Then thank them for having you with a Cran-Apple Cinnamon Loaf from Krusteaz. Whip up this delicious loaf and you’ll be everyone’s favorite guest! Heat oven to 350°F. Lightly grease 8x4-inch Loaf Pan. Stir together water, oil, cinnamon, eggs and muffin mix until blended. Gently stir undrained cranberries from the mix into batter. Spread batter into lightly greased loaf pan. Top with sliced apples, sprinkle with sugar and additional cinnamon to taste. Bake 45-50 minutes or until golden brown. Cool 5 minutes; gently loosen loaf from pan. Cut into 1 inch slices. Store cooled bread in airtight container.